Good looking in the raw the 80% pork in natural skins, which cooked up initially really well but as they browned there was unfortunately quite a bit of leakage from the skins from small splits. The molten goats cheese seemed to change to a rather pale liquid that oozed through the splits, caramelised in the pan and then coated the outside of the sausages. 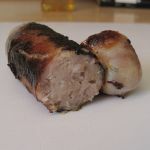 The texture was a very good medium providing a good bite and with quite a bit of moisture still retained made for a succulent sausage. However the caramelised cheese on the outside of the skins detracted a bit from what was a good goats cheese taste from the meaty insides. I was so concerned that I had perhaps mistreated the sample sausage in the cooking process, I cooked up the remaining sausages a few in an alternative pan and the rest I grilled under a moderate heat. Cooked on a much lower heat setting in the pan did reduce the splitting but the unfortunately the results were similar. However, grilled, this did work quite well. 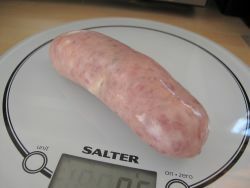 A very nice tasting sausage, but I would suggest grilling rather than pan frying for best results. 110x32mm before cooking, 108x32mm after. 88g before cooking, 79g after. That's a shrinkage of 2% & weight loss of approx 10%.